As one of my modules at University this year will require me to learn Java, and I like to get a head start on things, I decided to jump into Java. Using the very helpful course on WiBit.net (if you want to learn programming, check them out! Seriously!) I got a basic grasp of Java and started tinkering around with little things (see Learning-Java repo) but then my Christmas break came and I hibernated for a month. 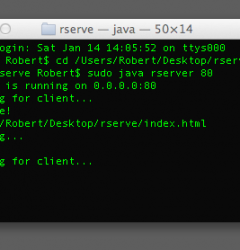 Once back at uni, I decided to create a web server as a personal project in Java as a way of ‘relaxing’ in-between catching up with the work I should have done over my Christmas break. This is an ongoing project, but at the time of publishing this post I have just got it to serve the file at the requested path. Next step is constructing a response header rather than just throwing the file back at the client. You can follow my progress on the rserve GitHub repository. Feel free to fork my code, send pull requests to help me out, or submit an issue.